It turns out the warm and sunny weather of the day before was a fluke. The sky was overcast when we started walking to the train station, and it began raining lightly along the way. While the temperature outside was cool, the train station was hot and packed with people. We picked up our tickets, checked our luggage, and received fancy pins to wear that alerted everyone that we were highfalutin GoldStar passengers. All aboard. Waiting to depart - looking forward from our seats in the GoldStar Dome. I knew that this experience as a whole was going to be great, but I was really excited for this train trip. It had been a long time since I'd ridden a train; not wanting to take any chances, I took motions sickness medication as a precaution, hoping the less drowsy formula wouldn't put me in a stupor. Vague, foggy memories of a childhood trip to the Rocky Mountains, during which I was slumped – not quite awake, and not quite asleep – in the backseat of my parents' car as it wound up and down mountain roads always give me pause when considering taking motion sickness meds. I was like the NazgÛl, neither living nor dead. I wanted to be conscious for this experience. I recommend booking seats on the train early if choosing the GoldStar dome service. We made our reservations in late March and had great seats – row six in the first upper passenger deck. Row one had the best view, and I wondered how much earlier the people in those seats made theirs. (Something to shoot for next time I'm in the neighborhood.) Huge picture windows curve uninterrupted into the transparent dome ceiling, providing expansive views. Unfortunately, the splattering of raindrops made it difficult to take photos out of our window, but because we were fancy, our car had its own outdoor viewing platform, which solved that problem. Once we were out of the immediate Anchorage area, we made many trips to this outdoor deck for as long as we could stand the cold wind. We also had a small bar, where booze could be purchased throughout the trip. Luggage was loaded into baggage cars, passengers were settled in their seats, and the train left the station at 6:45 a.m. Shortly after departing, breakfast was served in the dining area on the lower level of our car for those who were interested. Always interested in breakfast, we both ordered dishes featuring reindeer sausage, with hot chocolate for Andrea and a bloody Mary for me. 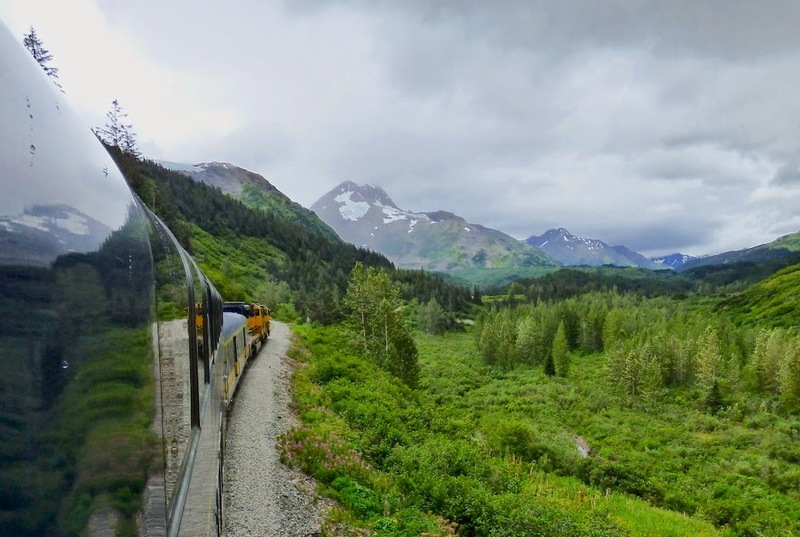 Naturally, during the few minutes I took to use the restroom – a slightly challenging activity while being jostled around in a tiny space – I missed a bald eagle flying next to the train. As we ate breakfast, we watched the suburban sprawl of the Anchorage area disappear to be replaced by meadows, streams, and the Chugach Mountains on one side, and Turnagain Arm on the other. 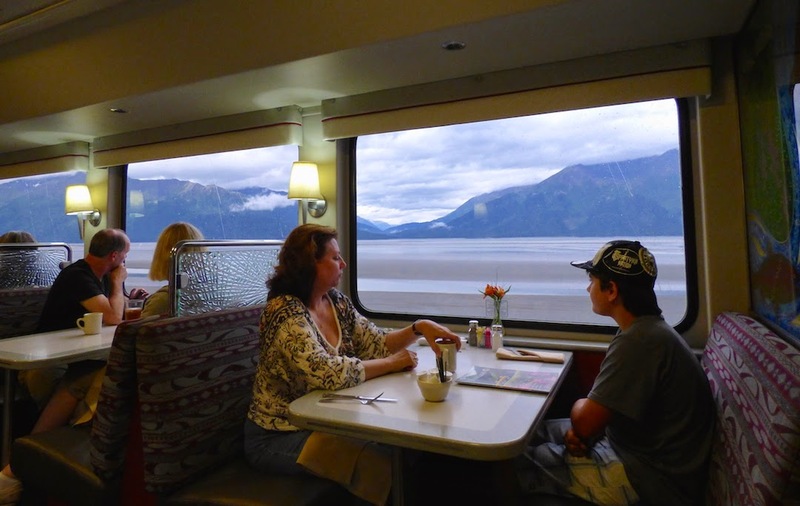 In the dining car, traveling along Turnagain Arm. This passenger finally convinced her kid to put his tablet away (note the slightly smug look of victory). Turnagain Arm is one of two branches of Cook Inlet (the other is Knik Arm to the north). It is known for its extreme tide variation of up to 40 feet, which rushes into this narrow channel as quickly as 10 mph. Expansive mudflats are exposed during low tide, and they are surprisingly dangerous. Formed by silt deposited when the tide comes in, they look deceptively stable when the tide goes back out. While they might appear dry on the surface, underneath they can still be saturated. When standing on these mudflats, if a person's foot sinks through the surface, things can get terrifying quickly. The wet silt is like quicksand, and there are horrific stories of people being trapped – held in place and helpless as the nearly freezing water of the tide comes in at its accelerated pace. 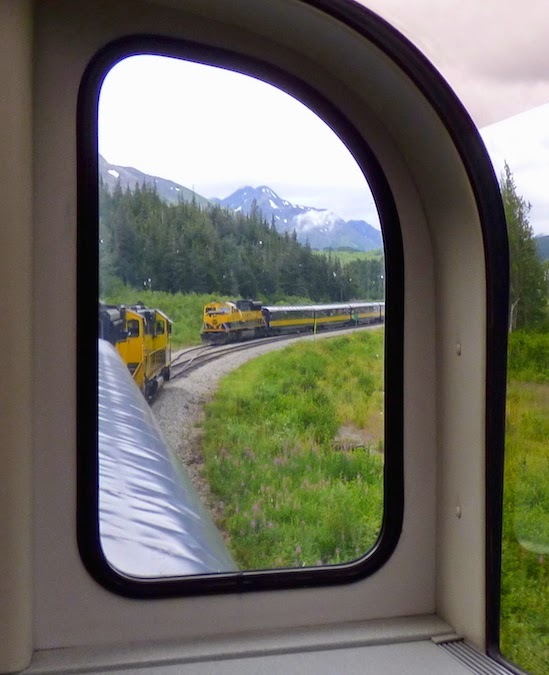 Alaska Railroad personnel periodically provided commentary, sharing the history behind the region and various landmarks. Evidence of the 1964 earthquake revealed itself here and there in the occasional cluster of ghost trees – preserved skeletons of trees that were killed when the ground sank and saltwater rushed inland, saturating the ground before being absorbed into the trees' roots. My first Alaskan wildlife sighting happened during breakfast as we passed close to some cliffs. We were advised to keep a lookout, as Dall sheep are sometimes seen on the cliffs' higher reaches. Shortly after this advisement, someone shouted “sheep!” and we looked to see one or two white specks high up on the cliff. Zooming in through the window of the bumpy, speeding train, my camera managed to catch one. Success! 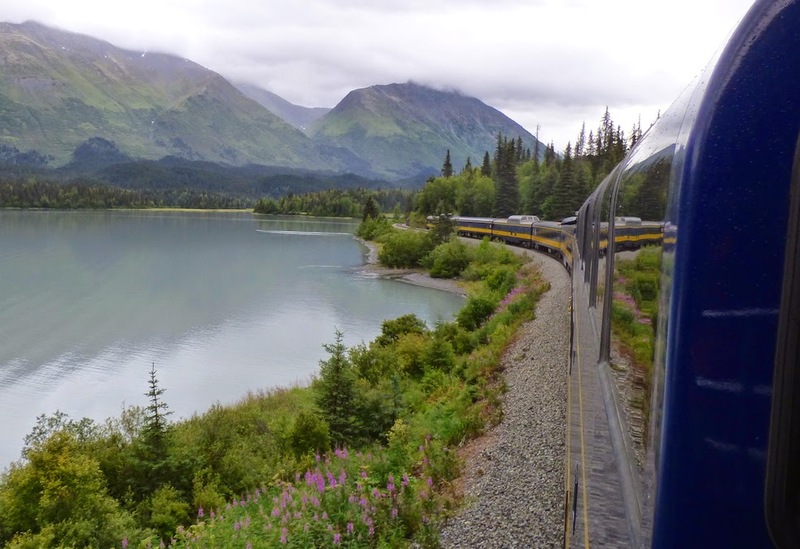 Once the train reaches the end of Turnagain Arm, it heads inland into Chugach National Forest, and the Chugach Mountains give way to the Kenai Mountain range. 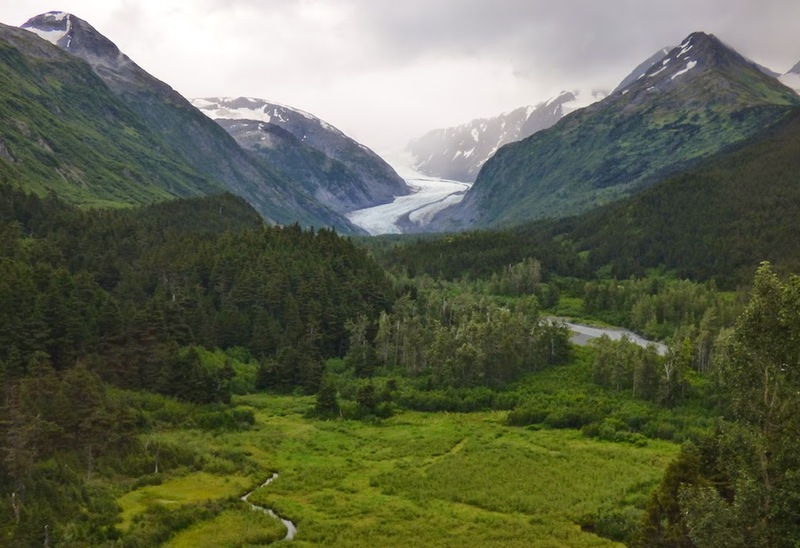 We observed a bald eagle perched on an upper branch of a tree at the edge of a meadow as we headed into the mountains, and soon after, the first impressive glacier scene came into view: Spencer Glacier. 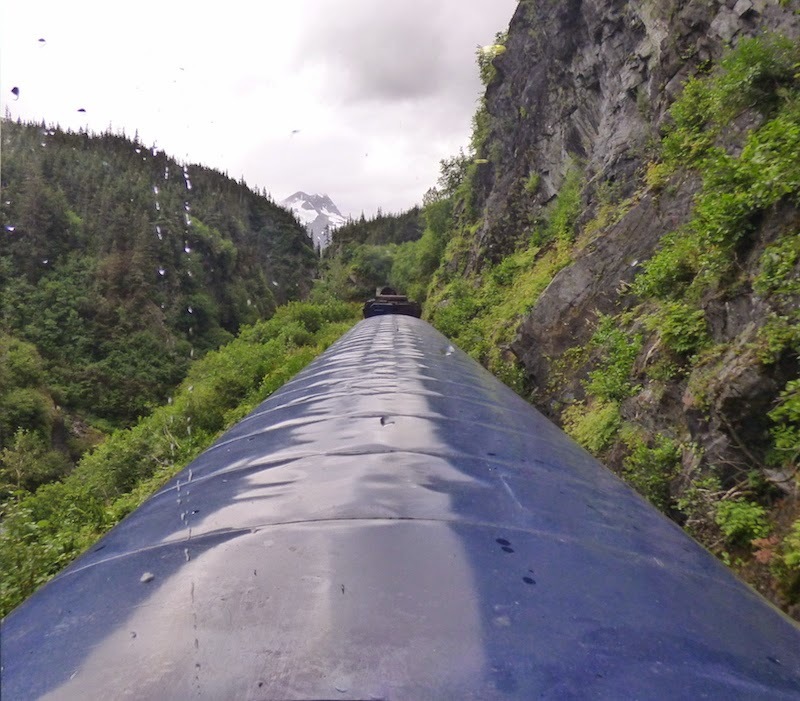 Following Spencer Glacier, the train winds through a series of tunnels, with views of Placer River just off the tracks. Then comes an area called Grandview, a mountain pass with spectacular views. The scenery is gorgeous, and although I had admittedly hoped for a sunny day, the imposing sky lent a dramatic effect to the scenery. We spent a lot of time on the outdoor viewing platform, occasionally returning to our seats to warm up. After Grandview, the train offers another impressive view of a glacier at work carving out a valley between mountains. 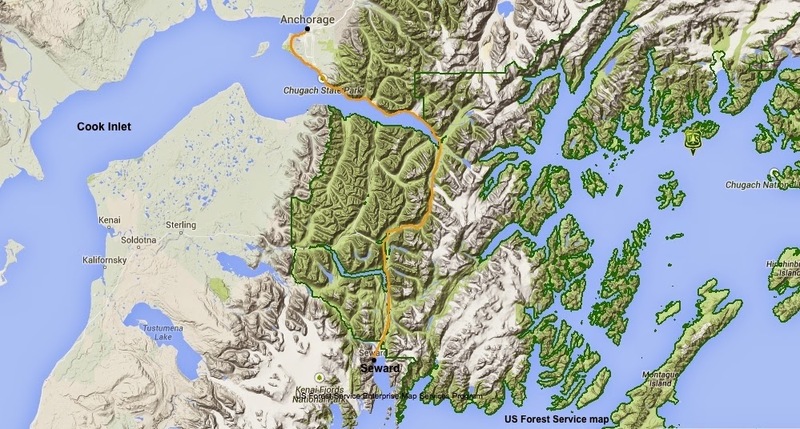 Trail Glacier is particularly beautiful, with scenic landscape unfolding in layers before the train tracks: mountains give way to forest, which opens up into a meadow with a stream winding through it. After that, it's view upon view of Trail Creek, Upper Trail Lake, streams flowing down mountainsides from melting snow and ice at the top, and the train tracks winding through it all. It was awesome in the true sense of the word. To celebrate this, we drank mimosa. Trail Glacier. This place actually exists in real life. The only way this could be better is if a couple of bear cubs were paddling a tiny canoe in that stream. The tracks wind past the town of Moose Pass, where it appears that every one of its 200 residents owns a float plane. Impractical where I live, but I feel like I should have one. 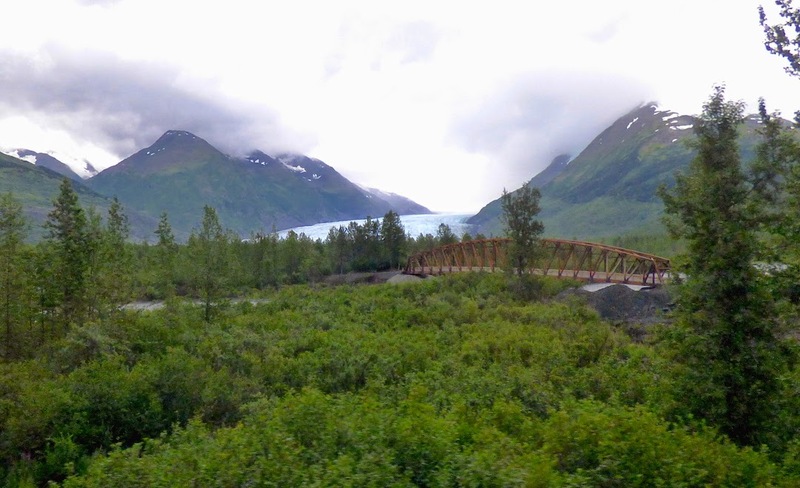 The train crosses a bridge over Trail Creek, then heads toward Kenai Lake, and finally Seward. Despite my extreme excitement for this train trip, I am ashamed to report that I caught myself dozing shortly before arriving in Seward. The combination of Dramamine, bloody Mary, and mimosa may have been a contributing factor. We arrived in Seward around 11:15 a.m. It is a short walk from the train station to the harbor, which was filled with fishing boats, sailboats, tour boats, and one huge cruise ship. 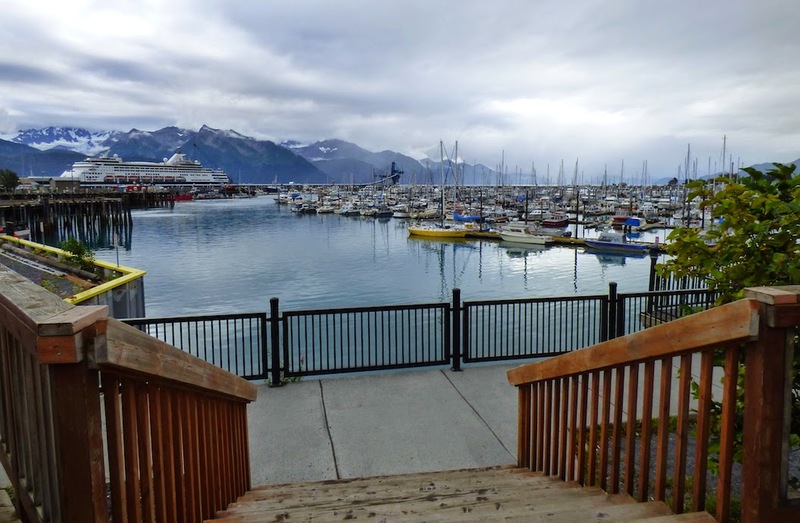 The Port of Seward is an active port with boat repair yards and a coal-loading facility. We were staying at The Whistle Stop, a converted train car right on the harbor. We were concerned that it would be loud there during the night and early morning since it is located directly on the harbor, but it proved to be a quiet and comfortable place to stay. We were too early to check in, so we dropped our duffel bags off and headed out to explore the town. Seward is beautiful. 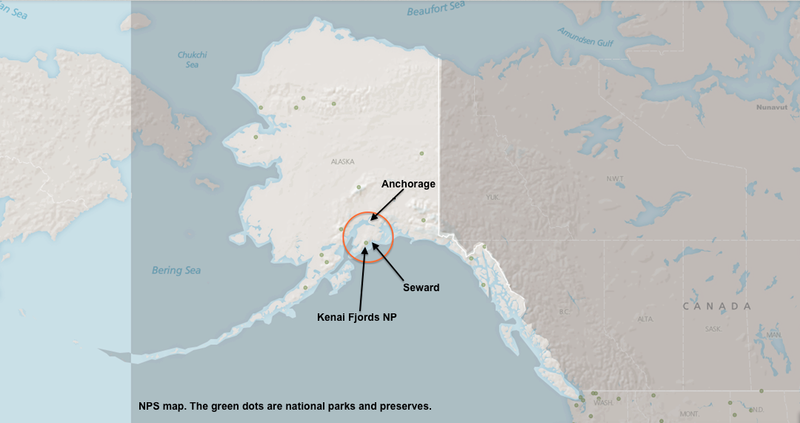 Nestled at the foot of mountains on Resurrection Bay, it is the gateway to Kenai Fjords National Park. 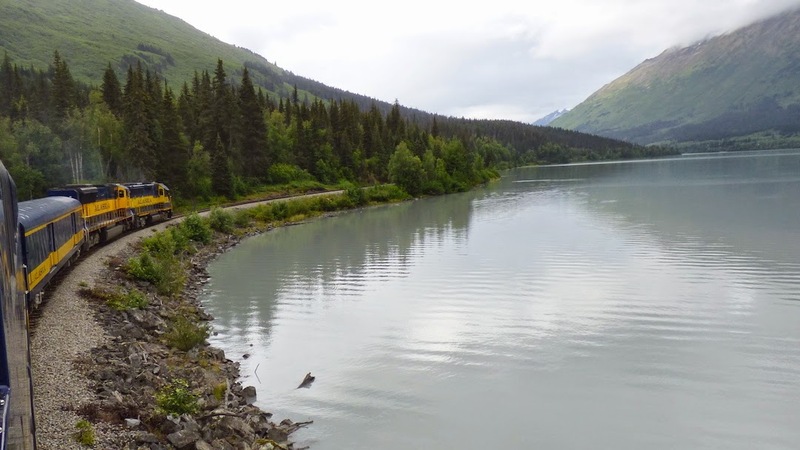 A small corner of the park can be reached by car just outside Seward; however, the majority of the park is best accessed by boat. Various boat tours depart Seward's harbor daily, and water taxi services can drop kayakers off at various locations within the park, where they can paddle and camp if they so choose, before meeting back up with the water taxi to return to town. Tour boats in the harbor. Fireweed in the foreground. We walked the length of town, past charter offices, restaurants, and gift shops, to the Alaska SeaLife Center, an ocean wildlife rescue center and aquarium. We spent some time there touching sea stars and sea urchins in open tanks, watching Woody the sea lion flop around and roar, and observing a puffin shoot its feces an impressively long distance at an unsuspecting tourist. To celebrate this, we ate crab. We ate a late lunch/early dinner at Chinook's, where we enjoyed poutine, Alaskan king crab, and a crab melt sandwich. After that, we returned to the Whistle Stop to take a nap and recuperate. Later, we followed the Coastal Walk past salmon spawning in a stream and along the bay to the historic marker of the starting point of the Iditarod National Historic Trail. There is a monument with a plaque and a replica of a sled. I expected a statue of a dog; it seems odd that there isn't one. We watched sea otters floating on their backs offshore, and a bald eagle soared overhead, scanning the shallow water near shore for dinner. As we returned to our room on the harbor, the setting sun behind us cast orange light on the mountains across the bay. It was finally sinking in that we were in Alaska. That's gorgeous! Can't wait to see how things went in the park.